This is an updated version of previously published article. Nemy has done a marvelous job in updating the information and illustrations of seldom seen materials. 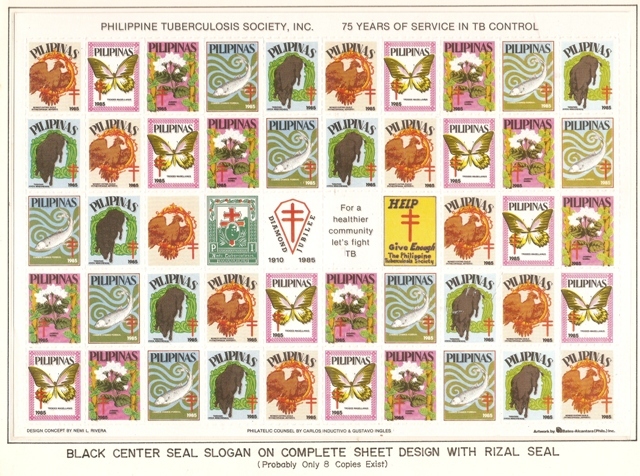 Philippine Christmas seals are produced and sold every year by the Philippine Tuberculosis Society, Inc., a private organization founded primarily to combat tuberculosis. Thus, these seals are often referred to as “TB Christmas Seals”. 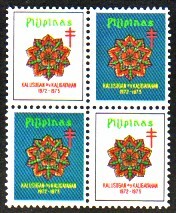 The Philippines’ first Christmas seal was issued in 1910. (Fig. 1) Thereafter there were intermittent issuances until 1947, when seals were regularly printed and released once a year towards Christmas. 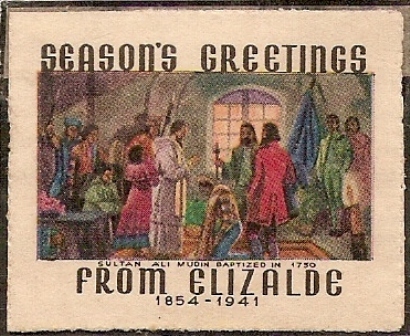 The now rare 1935 Quezon’s birthday strip seals, although strictly not a Christmas issue, are included in the Christmas seal collection because these are listed and illustrated in Green’s Catalog of Tuberculosis Seals of the World, together with all TB Christmas seals issued in the Philippines and around the world. (Fig. 2). This catalog is considered by many as the Bible of Christmas seal collectors. 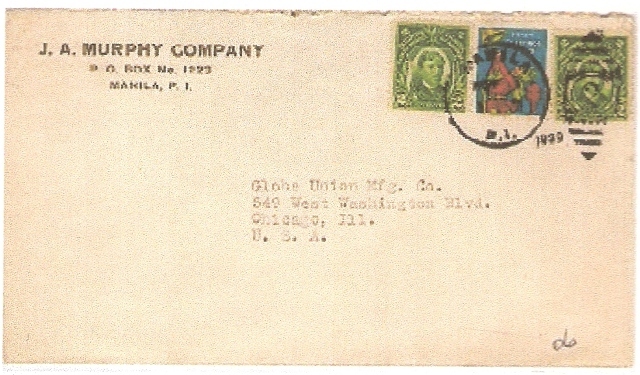 The first three issues were printed in Manila. From 1947 to 1970, printing of these seals were largely done in the United States, except for some years in the 1960s when seals were printed in Japan. 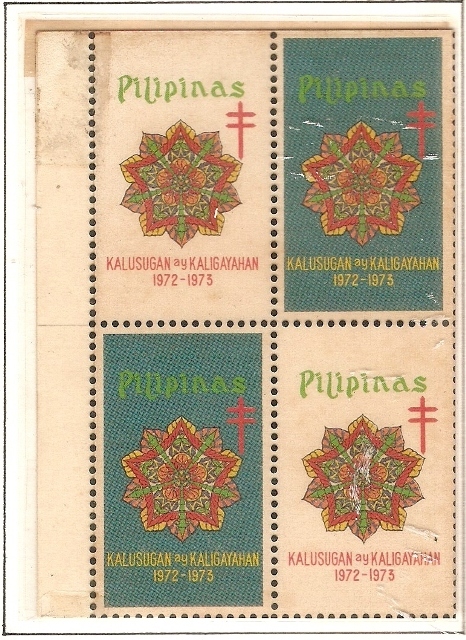 From 1971 onwards, seals were printed in the Philippines by various local printers. In 1971, the Rotary Club of the Philippines issued its first ever Christmas seal, which secondarily promoted its “Buy Philippines” campaign. (Fig. 4). This is a truly Christmas seal issue, similar to the Elizalde seals, but due perhaps to its limited availability and low awareness among collectors, this seal, sadly, is not present in many Christmas seal collections. After reading a draft of the article, a resourceful collector-friend, Capt. Roberto V. Araos of Quezon City, called and sent in three heretofore unheard of amazing non-TB Christmas seals. One was issued by Tanduay Distillers, the other two by Mobil Oil (?).(Fig. 4a.) These measured 32 x 34 mm. and 28 x 32 mm, all perf. 11. Unfortunately no other details were available. We shall be most grateful if someone who owns, or have access to these seals, can send us more information. 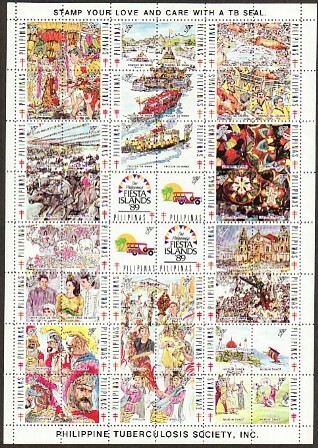 The Foundation for the Rehabilitation and Prevention of Blindness in the Philippines (FRPBP) made yearly issues of its charity stamps from 1987 to 1990. 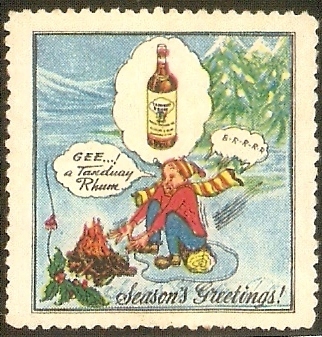 Because the Postmaster General in 1987 allowed the sale of these stamps thru postal windows, alongside the TB Christmas seals, some collectors mistook these for legitimate Christmas issues and tentatively mounted them in their albums. The FRPBP seals are generally poorly produced, but some se-tenant issues are unique and attractive. (Fig. 5 and 5a). 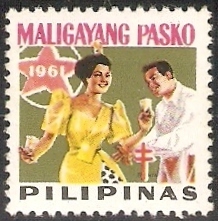 After the first three issues, the early Christmas seals hewed to traditional Christmas themes - of Pilipino families preparing for and celebrating Christmas. The Nativity was symbolized by several versions of Mother and Child. 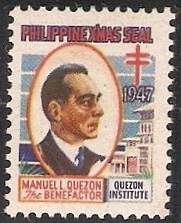 Two Philippine presidents were singularly honored on Philippine seals: the fiery and colorful Manuel L. Quezon, first President of the Philippine Commonwealth was portrayed in the seals of 1947 (Fig. 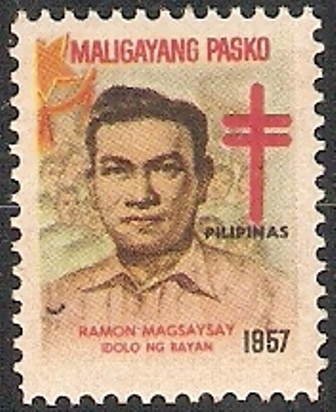 6); and the supremely popular “idol of the masses” Ramon Magsaysay was featured in the 1957 seals. (Fig. 7). 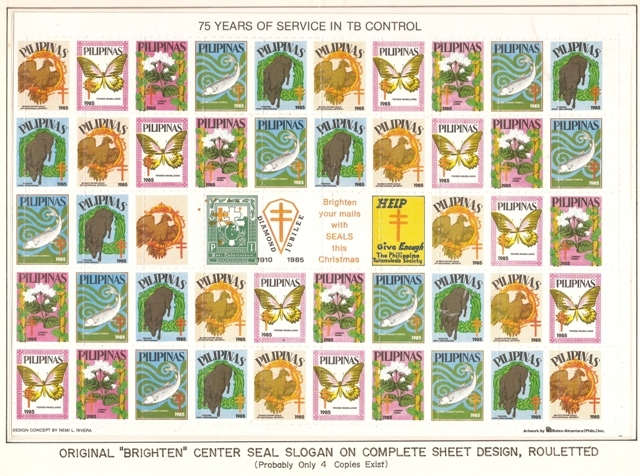 Seal topics briefly shifted to the cultural and floral in the 1960s and early 1980s. 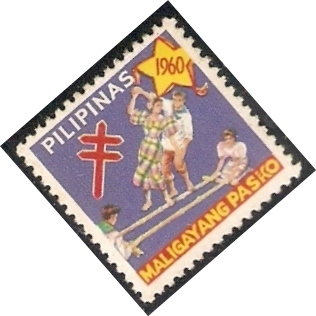 The Japan-printed seals of 1960 and 1961 pictured the graceful native dances of “Tinikling” and “Pandanggo sa Ilaw” (Fig. 8 and Fig. 9). The finely-drawn Sampaguita, the national flower (Fig. 10) and the rare Mindanao orchid, the Waling-waling, were the subjects of the 1969 and 1970 issues. The five different cultivated Mussaendas, each named after a former Philippine first lady, graced the seals of 1982. Directions for seal designs were verbalized in 1987. 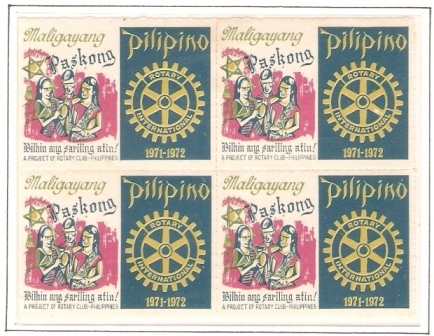 Concept statement suggested that seal designs follow a “national orientation – which a Pilipino would take pride in, to own, show and send to friends abroad.” Thus the seal sheet of that year depicted a pleasant se-tenant mix of native sceneries, dances, fruits, festivals and old transportation. 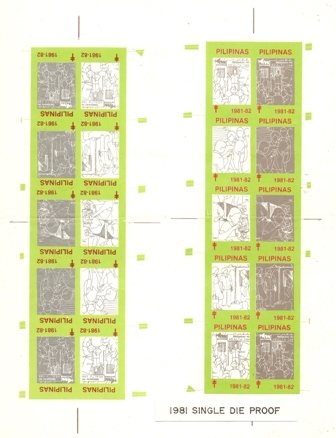 The 1990 design portrayed six indigenous ritual dances, some tribal, captioned with original names, the “banga”, “sakuting’, “dugsa”. “maglalatik” and “binasuan”. Incidentally,. this issue pioneered the inclusion of free raffle tickets as part of the sheet. There were a first and a second printing, with major differences between printings. In the late 1990s, themes dwelt more strongly on nationalism and love of country. Seal designs extolled “the Filipino stalwarts who contributed most significantly, during the last century , to the enhancement of Philippine independence and nationhood.” Honored with portrayals in the seal sheets of those years, se-tenant with other designs, were Pilipino greats – Andres Bonifacio, Apolinario Mabini, Marcelo H. del Pilar, Macario Sakay, Jose Abad Santos, Jose P. Laurel, Benigno Aquino, Chino Roces and a host of other revered personalities. 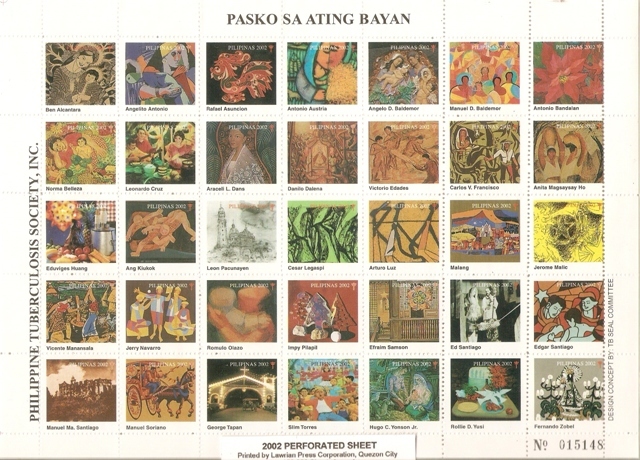 The year of the painting series was ushered in in 2000, when the multi-awarded versatile international painter-sculptor Manuel Baldemor consented to have forty of his artworks reproduced free to form the colorful se-tenant sheet of that year. This was repeated when forty other art pieces of Baldemor were likewise featured in the 2003 seal sheet. 3. The material in normal use. As much as possible, the mint or unused seal should be in sound condition – no damage to paper, separation or color. Some collectors require original gum, others do not care too much ( ! ). 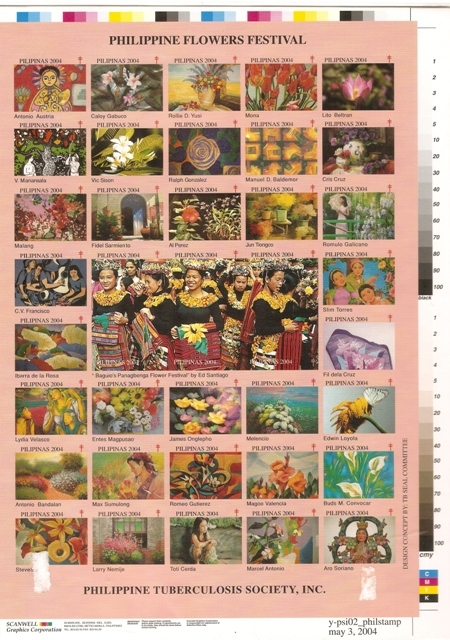 If included in the regular issuance, the imperforate of the seal and the souvenir sheet are collateral members in this phase. 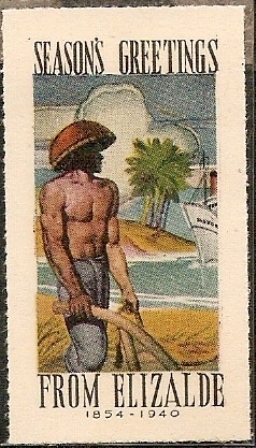 If no souvenir sheet was issued, the single die proof may replace this material. Samples of the material taken from the production stage would include separation and printing errors, essays if any, color separation and progressive color proofs proofs and proof runs. Some interesting printers’ waste are also collectible. The “excitement of the chase” heightens during this stage. Some proofs, essays, unusual errors and other production oddities are often difficult to come by. But these provide the “icing on the cake” so to speak, and will test the mettle and ingenuity of the collector in locating and securing the prize item. Postal usage is the final stage in the life of the collected seal. Because seals have no franking value, they have to be paired with postage stamps, and incidentally immensely brighten the mail during the Christmas season. 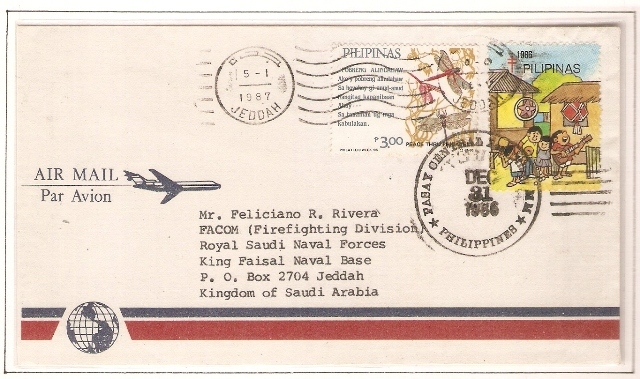 It is important that the postmark or postal cancellation “ties” both the seal and the stamp to the cover. 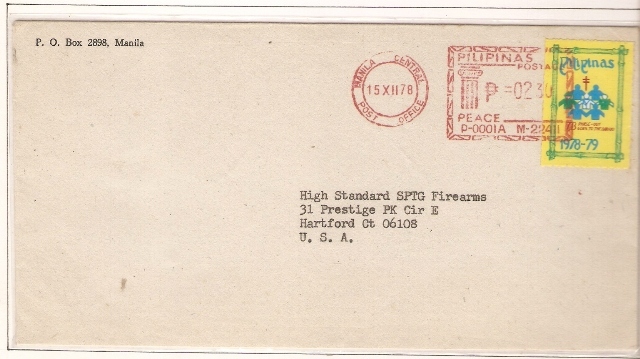 A preferred used cover is one with postmark clearly showing place and date of usage. A clean backstamp reinforces proof of usage and enhances desirability of the cover. The goal of every collector is to complete his collection in the manner he prefers. Some aspire for no more than having a representative seal “from first to last” in the order of chronological issuance. Some might later view this as too staid and clinical, and would now and then add a few tied-on covers as he finds them. These new additions begin to infuse life into the collection. The more curious and intrepid collector would further expand this accumulatio0n. Little by little, the collector would acquire some needed complementing, but more difficult to find items. These might include seldom-seen proofs, essays, astonishing errors, and even the originals of the first seals. We have heard of some very lucky collectors owning any of these first seals cleanly tied on cover. These are extreme rarities. Even the early Republic seals properly tied on cover could be appraised ten-fold or even much more over the value of the seal. The approved 1985 single die proof, including the rejected ones, are equally elusive. 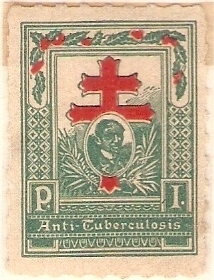 The trial single die proof on scrap paper, with the Quezon seals smaller than actual, and the TB cross inside the 1946 seal in black, instead of red , is a rarity. 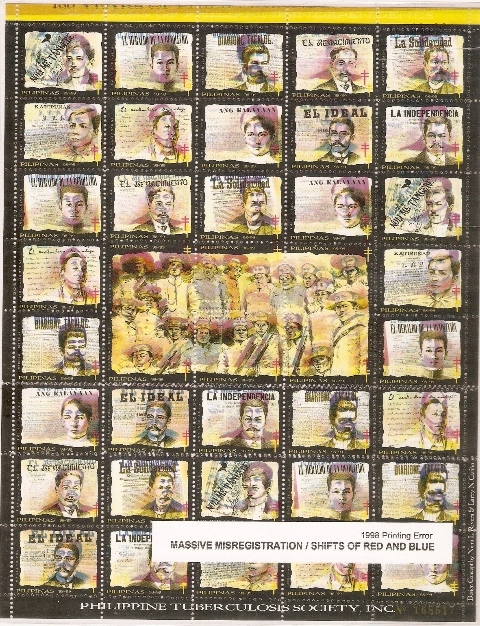 Possibly only four complete sheets were printed of the 1985 Essay No. 1, with the center seal slogan reading “Brighten your mails with SEALS this Christmas” instead of the regular “For a healthier community, let’s fight TB”. (Fig. 21). Some varieties, all with the Rizal green not yet printed, are just slightly less difficult to find. Similarly, perhaps only a very few complete sheets were made of the 1985 Essay No. 2, with center seal slogan “For a healthier community, let’s fight TB” in black instead of the regular red. 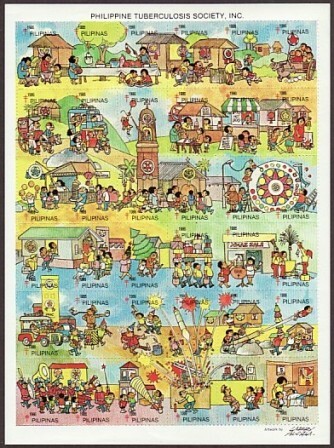 Likewise, there are varieties, all with the Rizal green missing, that are just slightly easier to find. 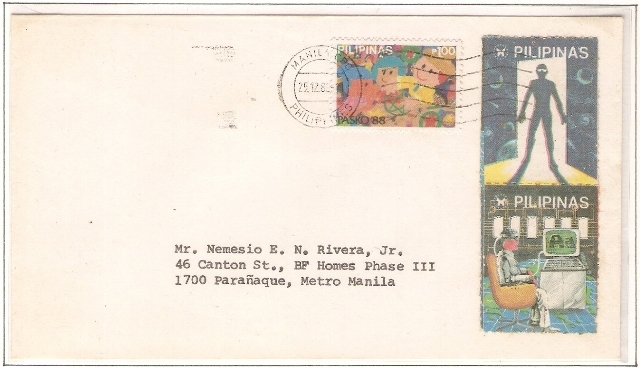 The progressive color proofs of 1947, 1979 and 1984 are extra-scarce. Of the 1947 PCP, one US dealer quipped, “I know they exist, but I have not seen any.” The 4-stage 1977 and the multi-stage 1984 PCPs were unissued and were only scrounged from printers’ waste. The 2004 essays are of recent vintage but are already extremely scarce. Essay No. 1, in experimental dark pink background color, is a color separation proof, where the painting on seal frame no. 9 was replaced with another at the last minute. The regular sheets were subsequently printed with yellow background and with the replacing frame. Only seven or eight copies of this essay were printed. A one-of-a-kind 7-stage PCP of this essay was also made. The 2004 Essay No. 2 is almost identical with Essay No. 1, except that its background color is yellow. Also only seven or eight copies of this were made., no PCPs. The rarities are the jewels that crown the collection and make it distinctive over others. They endow the collection with color, drama – and intrinsic value, and the collector with that glowing feel of fulfillment. The collection is just comparatively completed but not closed. It shall remain open, receptive of new wondrous finds.